It may be obvious, but to be interested in something, you must first be aware of its existence. Organisations such as Geomatics.org provide a valuable service in bringing Geomatics into schools. One aspect of the initiative is the offer of survey equipment loans to schools so that students can get “hands-on” experience of Geomatics. This facility has been supported by several donations of survey equipment from manufacturers including Leica-Geosystems, Trimble and more recently, Topcon (see GW Sept/Oct 04). The equipment need not lie fallow during the summer holidays, and the geomatics.org.uk team would be keen to hear from people who provide activities for young people during the recess, such as BES Expeditions. BES Expeditions (formerly ‘The British Schools Exploring Society’) came into existence in 1932 from an educational idea by Commander George Murray Levick RN, a member of Captain Scott’s final Antarctic expedition of 1911 to 1912. The aim is to deliver a once-in-a-lifetime experience that is both challenging and fun and to develop essential skills in each of the Young Explorers taking part, including leadership, communication and teamwork skills that will help them in the future. Their aim is “To provide young people with an intense and lasting experience of self-discovery in a demanding and natural wilderness environment”. Exploration is the key element of such an expedition, but BES Expeditions also involve the Young Explorers in scientific activities. 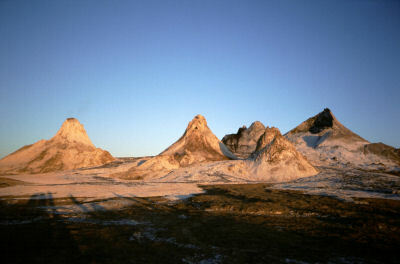 During the summer of 2004, BES Expeditions took their Young Explorers to Svalbard, Iceland and Tanzania. 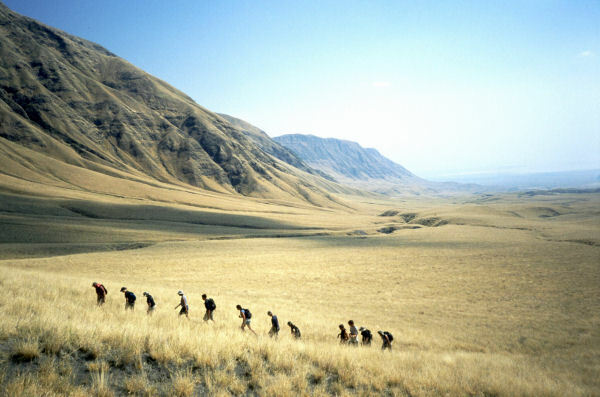 The safari to Tanzania was to the west of Kilimanjaro in part of Africa’s Great Rift Valley. South of lake Natron, against the western wall of the Gregory Rift, and towering above it, is a unique active volcano. Ol Doinyo Lengai, or The Mountain of God as it is known to the Maasai who live in this desolate region, is the only volcano in the world that erupts natrocarbonatite lava. This looks like very fluid black oil, but rapidly turns white as it absorbs water, which can give Ol Doinyo Lengai the appearance of being snow capped. The accuracy required between successive gravity meter readings was to be better than 0.1 metres. In order to achieve this Leica GPS SR530 receivers were used in differential mode. Four base stations were established during the expedition, and these were used for differential GPS observations to each location for the readings with the Gravity meter. These bases were occupied for up to 12 hours and were computed as base lines back to the IGS (International GPS Service) Station at Malindi on the Kenya coast. Malindi was the only IGS station close enough to resolve ambiguities, but the base lines to IGS Stations in the Seychelles and Mbarara in Uganda were also computed as a check on gross error. Using check bases and closed traverses we were able to establish that the precision of the results were better than 0.1m in both plan and height with many of the points showing much better results than this. The Leica GPS SR530 receivers, together with an aluminium tripod and the gravity meter, were backpack packed to some very difficult locations. 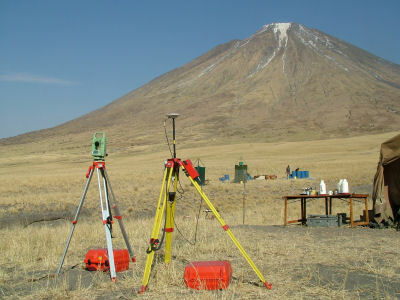 Gravity readings were taken at the top of Ol Doinyo Lengai and a traverse run down the steep lose slopes of the volcano. Readings were also made on the top of the western wall of the Rift Valley to complete the transit from Longido. The equipment proved its worth in this harsh environment and worked faultlessly throughout the expedition despite the heat and dust, and being used by inexperienced people. The Young Explorers also used Leica TCR700 and TPS1200 Total Stations during the course of the expedition. The main task was to take observation to produce a Digital Terrain Model (DTM) of the active crater of Ol Doinyo Lengai. The ideal Instrument for this was the newly launched Leica TPS1200 with its accurate long-range Reflectorless measurement capabilities. A Leica TCRP1205 and lightweight Aluminium Tripod were backpacked up the very steep path to the crater on the summit of Ol Doinyo Lengai, a strenuous climb gaining some 2000 metres in altitude, so the light weight of this Instrument was a blessing! A camp was established on the summit and it was a major logistical effort to supply food and, more importantly, water to support those staying up there and carrying out the survey observations. The other task that this technology lent itself to was to get a feel for the “accuracy” of a Navigated GPS solution. Garmin handled GPS units were used extensively throughout the five-week expedition for navigation and to determine the location for the Ecology Fire studies. 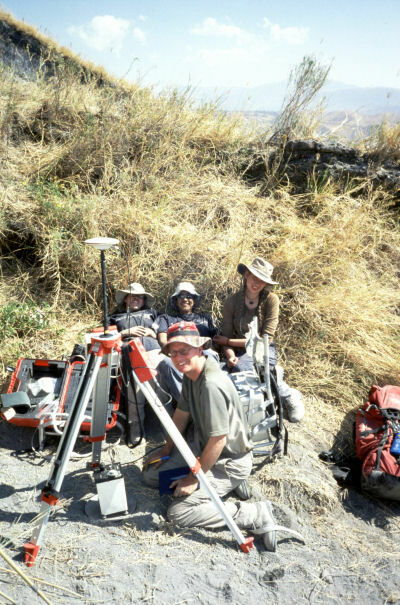 The team took advantage of the GPS measurements for the gravity survey to compare the accuracy of a Navigated GPS solution compared to the Computed result. We were only 2° 45’ south of the equator and had good GPS satellite coverage thought the expedition. The results showed that the Navigated positions made with the Leica SR530 GPS receivers were within 5 metres of the computed position in plan and 10 metres in height, although the majority were also within 5 metres in height. The Navigated positions provided by the small hand held Garmin eTrex receivers were within 15 metres in plan, although more than half were within 5 metres, but height was not so good with a difference of 75 metres for one location. Most of the Young Explorers and Leaders met for the first time in March 2004 at a “briefing weekend” at Hesley Wood Scout Centre in Sheffield, where they chose which Fire they wished to belong to. 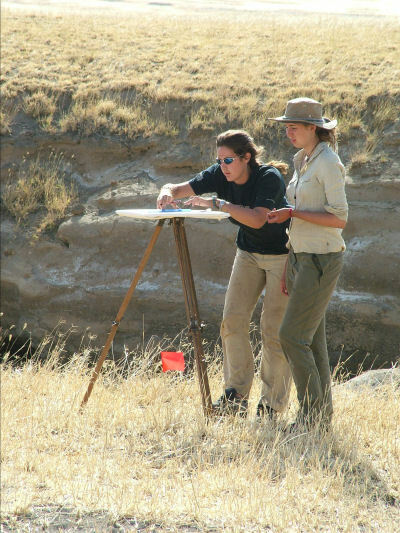 A very few had heard of GPS, but none really had an inkling of what Surveying (Geomatics) was about. There was much to do during that hectic weekend so most were still “in the dark” when they arrived at Heathrow Airport at 7am on Sunday 18th July. Five weeks on the BES expedition to Tanzania gave them a real taste of what Geomatics was all about. This really was an opportunity to bring awareness of Geomatics to young people starting out in life and into their schools. Most of the Young Explorers are now back at school completing their final year before going on to University and will talk about their African adventure, how they measured the gravity across Africa’s Great Rift Valley fixing positions with GPS, mapped the crater of an active volcano with a Total Station and made their own unique maps using a Plane Table. This type of activity, together with innovations such as Geomatics.org, will bring our profession to the attention of young minds. Those that took part will not forget this safari and its activities in a hurry, and their experiences will be communicated to the wider audience.